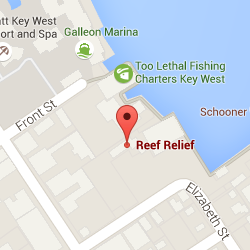 The City of Key West and Reef Relief established the Key West Marine Park in 2001. The park is a 40-acre area on the south side of Key West, stretching from Higgs Beach to South Beach. It includes two vessel access lanes, one in front of Casa Marina and the other in front of the Reach Resort. The park encompasses diverse ecological communities along the nearshore waters of Key West’s south shore. A variety of hard and soft corals, seagrasses, fishes, and invertebrates make their home within the park’s boundaries. The Key West Marine Park provides a first class experience for visitors from around the world and local residents. The Key West Marine Park is, also, a shore accessible protected snorkeling area. The designated swimming and snorkeling areas are marked by buoys; and it is recommended that guests stay within them, as the areas outside the buoys are frequented by boats. Within the designated area, however, is an underwater wonderland of colorful corals, sponges and seagrasses populated by grunts, crabs, starfish and snapper. The public can access the Key West Marine Park from four locations: South Beach at the southern end of Duval St., Dog Beach at the end of Vernon Street, the at the end of Seminole Street, and Higgs Beach from Reynolds Street to White Street. Reef Relief took over management of the Key West Marine Park in January 2012. Our responsibilities include outdoor educational signage, educational brochure distribution, maintenance of parameter buoys and vessel lane buoys and participation in the Higgs Beach improvement programs. Development of a year round educational program with the Sigsbee Charter School 7th grade and the Key West High School Reef Relief Club. A partnership with MOTE Marine on developing new educational brochures and a coral nursery within the park. Replacement of vessel lane buoys with green and red marker buoys. Improvement of water quality at Higgs Beach. Assisting with the design of exhibits in the future Higgs Beach nature center. Involvement of the Casa Marina, the Reach Resort and the Southernmost Hotel Collection with marine park education programs as well as the design and installation of an underwater interpretive snorkel trail. Reef Relief’s management of the Key West Marine Park includes in the water work by Reef Relief staff, Sigsbee Charter School student and the Key West High School Reef Relief Club. Data on water quality, fish and coral species, maintenance of buoys and installation of bird deterrents is being done on an ongoing basis.